"We get our bread at the risk of our lives because of the sword in the desert. Our skin is hot as an oven, feverish from hunger. Women have been violated in Zion, and virgins in the towns of Judah. Princes have been hung up by their hands; elders are shown no respect. Young men toil at the millstones; boys stagger under loads of wood. The elders are gone from the city gate; the young men have stopped their music. Joy is gone from our hearts; our dancing has turned to mourning. The crown has fallen from our head. Woe to us, for we have sinned! Because of this our hearts are faint, because of these things our eyes grow dim for Mount Zion, which lies desolate, with jackals prowling over it. You, Lord, reign forever; your throne endures from generation to generation. Why do you always forget us? Why do you forsake us so long? Restore us to yourself, Lord, that we may return; renew our days as of old unless you have utterly rejected us and are angry with us beyond measure." Food had been scarce during the last several years not only because of the siege, but also because of the famine that had struck the land. The lack of food continued even outside the walls of fallen Jerusalem. Attaining food was not only difficult, but also dangerous because of the raiders who moved freely through the land searching for food. Dehydration (from lack of food and water) made the bodies of the Jews who remained in the land feverish and discolored. Virgins from all the remote rural towns in Judah have been taken by Babylonian soldiers and officers. Princes, the bodily remains of men from the royal family that did not try to escape with Zedekiah and where not taken back to Babylon are still hanging by their hands on the walls, buildings and trees for birds and wild animals to eat. Women and young girls where filled with joy as the danced in the glory that came from culture with structure and freedom. But, all this has changed because of sin. The ruins of the glorious Temple and its courts on Mount Moriah are now nothing more than hunting grounds for wild jackals who are also scavenging this desolate land for food. Yet, in this hopeless state Jeremiah ends his book of lamentation seeking the Lord and crying out for mercy. What else can they do? So, now, they wait in hope for their restoration. Paideia (Gr) – correction (Eng) – the Greek word paideia refers to training a child with instruction. It can be translated: “discipline,” “correction,” “instruction,” “training.” Paideia is used in: Ephesians 6:4 – “Fathers, do not exasperate your children; instead, bring them up in the training and instruction of the Lord. Hebrews 12:5 – “And have you completely forgotten this word of encouragement that addresses you as a father addresses his son? It says, 'My son, do not make light of the Lord’s discipline, and do not lose heart when he rebukes you...' " Hebrews 12:7-8 – “Endure hardship as discipline; God is treating you as his children. For what children are not disciplined by their father? If you are not disciplined—and everyone undergoes discipline—then you are not legitimate, not true sons and daughters at all." 2 Timothy 3:16 – “All Scripture is breathed out by God and profitable for teaching, for reproof, for correction, and for training in righteousness." 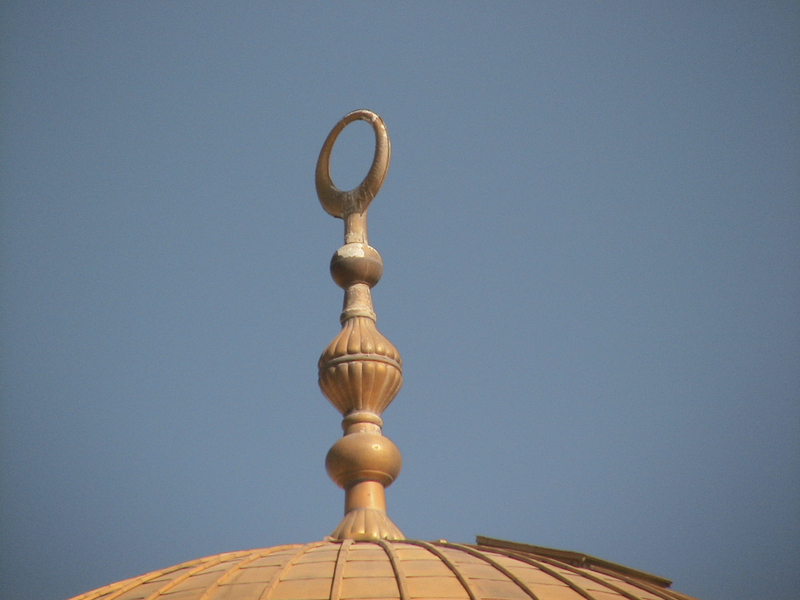 The top of the Dome of the Rock on the Jewish Temple Mount is a crescent moon whose tips touch, creating a full moon. The moon is a traditional symbol of the moon-gods throughout the ancient Middle East throughout history. The Sumerians worshipped the moon-god named Sin whose symbol was the crescent moon (Gideon took the crescent jewelry from the invading eastern peoples called Midianites and Ishmaelites in Judges 8:24-26). The temple of Sin has been excavated in Abraham's old city of Ur. YHWH told Abraham to leave his culture, his land and his family who were worshippers of this Pagan moon-god (Genesis 12:1; Joshua 24:2). Throughout the Old Testament worship of the moon-god and other heavenly hosts is forbidden and met with judgment (Deut.4:19; 2 Kings 21:5; 2 Kings 23:5). This moon on the top of the dome of the Rock is aligned so that if you look through it, you will look straight toward Mecca, the seat of the Black Stone. 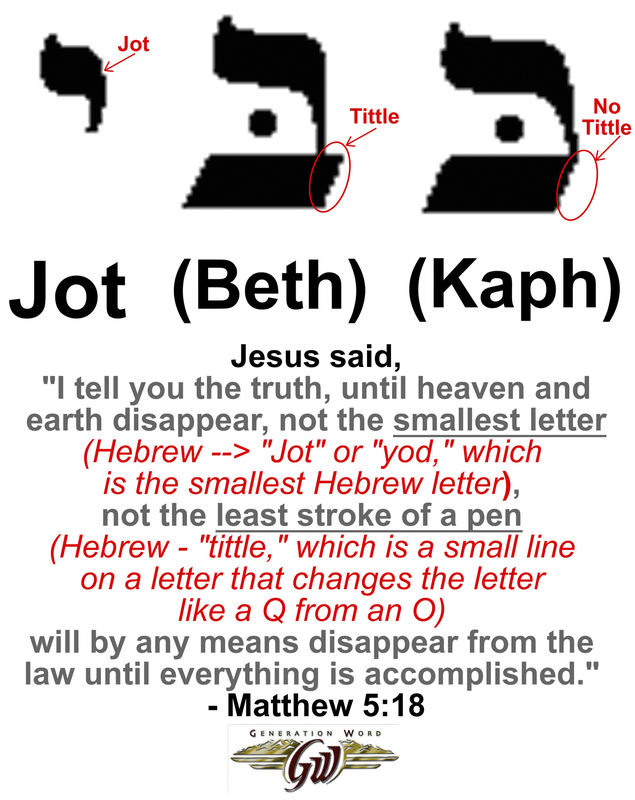 The Jot and the Tittle detailed in a diagram that helps explain Jesus teaching in Matthew 5:18. An imprint in a clay seal was found in Lachish that reads: “The property of Gedaliah who is over the house.” This clay seal had at one time sealed a papyrus scroll. The imprints of the fibers from this scroll can still be seen on the back of the clay seal. "A gift opens the way for the giver and ushers him into the presence of the great." 13 “On that day a fountain will be opened to the house of David and the inhabitants of Jerusalem, to cleanse them from sin and impurity. 2 “On that day, I will banish the names of the idols from the land, and they will be remembered no more,” declares the Lord Almighty. “I will remove both the prophets and the spirit of impurity from the land. 3 And if anyone still prophesies, their father and mother, to whom they were born, will say to them, ‘You must die, because you have told lies in the Lord’s name.’ Then their own parents will stab the one who prophesies. “Awake, sword, against my shepherd, against the man who is close to me!” declares the Lord Almighty. “Strike the shepherd, and the sheep will be scattered, and I will turn my hand against the little ones. In the whole land,” declares the Lord, “two-thirds will be struck down and perish; yet one-third will be left in it. Then the commander gave him provisions and a present and let him go. 6 So Jeremiah went to Gedaliah son of Ahikam at Mizpah and stayed with him among the people who were left behind in the land. 11 When all the Jews in Moab, Ammon, Edom and all the other countries heard that the king of Babylon had left a remnant in Judah and had appointed Gedaliah son of Ahikam, the son of Shaphan, as governor over them, 12 they all came back to the land of Judah, to Gedaliah at Mizpah, from all the countries where they had been scattered. And they harvested an abundance of wine and summer fruit. 13 Johanan son of Kareah and all the army officers still in the open country came to Gedaliah at Mizpah 14 and said to him, “Don’t you know that Baalis king of the Ammonites has sent Ishmael son of Nethaniah to take your life?” But Gedaliah son of Ahikam did not believe them.